Hi everyone, this is Aamir Hussain and welcome to Raspberry Pi 3 starter guide !! In this article you will learn what is Raspberry Pi, how to set it up and what cool things you can do with raspberry pi. Raspberry Pi is world’s smallest single board computer, developed in United Kingdom by Raspberry Pi Foundation on 2018 . The main purpose of this device is to provide education to small kids in developing countries in very low possible cost. It runs on Debian based operating systems to learn coding, programming and basic computer knowledge. But from 2008 to 2018 world is changed very fast and people loves to use Raspberry Pi as various platforms like Hacking, Programming, robotics, Multimedia, Weather Device, Gaming and thousands of projects. In this article i am helping beginners to get started with Raspberry Pi 3 Model B and how to do those amazing projects. Let’s get started !! The Raspberry Pi is not available in normal computer store, its available on online shopping sites. You can order your Raspberry Pi 3 and its accessories from banggood.com, its a most popular website witch provides cool Electronics Gadgets, RC Helicopters, Toys etc. Its ships products all across the world without delivery charges. I got my Raspberry Pi 3 & its all accessories from banggood. I said accessories right !! Yes guys to run the pi you will need its accessories, a power adapter and a Micro SD is compulsory to run the pi. But there are lots of cool gadgets available on banggood.com such as Pi Case, Heat sinks, Touchscreen LCD, Camera, Battery, sound card, cooling Fan, Game controller and many more things. Check out all cool stuffs from the links given Below. But first Watch the Raspberry Pi 3 Tutorial Video to learn How to set it up. Select your Raspberry Pi 3 Model B With Accessories or Without. Select a Display and Power Supply for Pi according to your Country. Select Micro SD , Card Reader, Power Bank and VGA to HDMI Converter. If you want to use Raspberry Pi on a PC monitor & you have old monitor with VGA, you can use VGA to HDMI Converter. Power Bank is useful when you are operating Pi with 3.5 or 5 inch display, it will make it portable. In memory card , 16 GB is enough for beginners but if you are an advanced user you can go on to 32 GB or more. I am recommending these items because i am using them and i have showed the uses of every item in my video tutorial. Step 3: Insert your Micro SD card on a PC or Laptop using the Card Reader. Step 5: Open Etcher and select the Raspbian OS Image file , also select the memory card then click on flash. Step 6: After flashing unplug the memory card from the PC and Insert it on the Raspberry Pi SD Card slot. Step 7: Congratulation !! You have successfully install Raspbian OS to the Raspberry Pi. Now Connect your Keyboard & Mouse to Raspberry Pi USB slot, Connect a PC monitor on Raspberry Pi Via HDMI cable (You can also connect it on TV). How to Connect Raspberry Pi on VGA Monitor ?? Raspberry Pi have only one slot for display in the board, Which is HDMI. But if you want to connect the Pi to a old monitor which is have only a VGA port, then you have to use a VGA to HDMI Connector to do that. Just order the converter from the link above, then once you got connect it to the VGA cable just like the picture below. Now You can plug the HDMI end to Raspberry Pi and the VGA end to the Monitor, Here we Done. How to Install LCD Display on Raspberry Pi ?? If you are wondering install LCD to Raspberry Pi, there are many versions of LCD for Pi but the popular and the cheap one is 3.5 inch LCD. 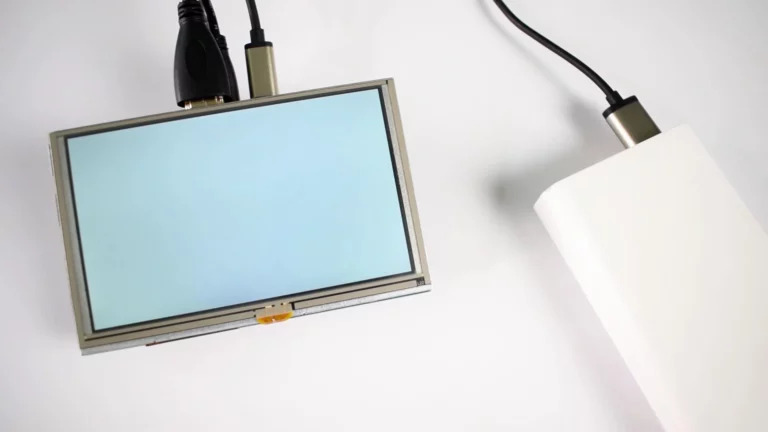 This small LCD is easy to install, you just have to connect the LCD to the GPIO pins on Raspberry Pi. Just like the Image below. Plugging the LCD will not work for the first time (you will get a white screen only) unless you have done some coding in Raspbian OS. Below are the very easy steps how to install a 3.5 inch LCD on Raspberry Pi. Step 1: Connect your Raspberry Pi to a PC monitor, also connect the 3.5 inch LCD to Pi. Step 2: Turn on the pi and make sure its connected to the Internet via WiFi or LAN. Step 3: Open terminal in Raspbian desktop, and type the following commands. Step 4: Congratulation !! You have successfully installed your Raspberry Pi LCD. But now the display will not visible on the PC monitor, it will only visible to the Raspberry Pi LCD. If you want revert back to the PC monitor, Open the terminal and type commands to get back. Will it work on my 32 inch LED TV? I’ve got rpi 2 and I follow the guide it worked but touch doesn’t work . Any help for me ? I have Pi 2 and a 3.2 inch touch display. display worked fine but touch is not working. Great tutorial!! Nice job with sharing the simple way to install the 3.5 inch LCD. The commands where quite easy and yet quite effective. se puede instalar windows 10 full, completa en mi raspberu pi3+? I have rpi 3 B+ and the LCD 3.5 display is working but not the touch. I use the june release of raspbian stretch. I tried this method using just Raspbian, and it works. However, I’ve got Raspbian running under Retropie. When I run retropie, the KUMAN screen just shows text, with the HDMI monitor showing the game. Can you do a tutorial on how to install the Kuman screen and make it work with Retropie? Thanks! My board comes with a 32g flash with noobs so I am assuming it since the screen is not active or installed I am not sure where to start. Hi I’m having a very big issue I am not able to keep my online active while I’m on West being in OS so I’m like I’m not a noob but I do need raspy and assistance thank you I’ll leave my address at the bottom I really need understanding and someone patient to teach me eaasily please thank you. how can i use it in drone? I got a weird color display on the 3.5 inch screen, is there any tuning ? also can I run Kodi to display to this tiny screen ?